Sailing under the radar, Ocean Sparkle Ltd (OSL) has quietly grown into a leading port operations and marine services company. The Hyderabad-based venture, owned by technocrats (55 percent) and private equity players (45 percent), runs one of the largest fleets of harbour craft in the country—about 100, comprising mainly tug boats, mooring boats, dredgers and barges. Though OSL began as a small marine service provider in 1995, it expanded its operations as India liberalised its port policies. It now has a presence in minor ports all along the coastline. Its main business streams consist of harbour towage, pilotage of various kinds of vessels including specialised tonnage like LNG (liquefied natural gas) carriers, management of ship traffic and communications, mooring services and oil spill response. Its stature has grown along with the size of its business. In the early stages, port developers would sign only short-term contracts with OSL. But today, most of its contracts with the minor ports are as exclusive service providers. They are also long-term 'take or pay' contracts with tenures ranging from five to 20 years. OSL has begun to make inroads into major ports too, with non-exclusive contracts for tug boats. Its operations at Dahej, Mormugao and Ennore, where specialised services are needed, are considered major successes; it is in joint ventures with Singapore's PSA International at these ports. OSL also manages three of India's four LNG terminals. It will soon start bidding for offshore supply contracts catering to the oil industry. The Men Behind It: OSL has four promoters, three of whom are engineers from the Directorate of Marine Engineering Training in Mumbai. They have served in sea-going vessels with large shipping companies. Chairman and Managing Director Jairaj Kumar started off at Great Eastern Shipping Company and later joined Mobil Shipping Company in London, moving back to India with Novopan. He is responsible for business development at OSL. Sanjeev Dhawan, who worked with Kumar at Great Eastern and Mobil, is joint managing director and manages OSL's dredging activity. Ashwini Kumar Sawhney is director (technical). He handles the acquisition of new tonnage and their technical upkeep. The fourth promoter, Virender Prasad, is a chartered accountant and has played a key role in pioneering deep sea tuna fishing in India. Dredging accounts for about 20 percent of OSL's revenues; 45-50 percent comes from operations at minor ports. Tug boat operations and third-party maintenance at the major ports complete the pie. Why It Is A Gem : OSL's promoters have been funding their expansion through private equity right from the beginning. Over the years, PE players have exited via secondary sales to newer firms. The first investors were Risk Capital Technology Corporation and the Andhra Pradesh government-backed venture capital firm, APIDC—they put in Rs 5 crore each. In 2003, Swiss Technology Development entered with Rs 25 crore. In 2008-2009, IFC Washington invested Rs 50 crore. Standard Chartered Private Equity entered with Rs 120 crore last year, valuing OSL at Rs 1,000 crore. One of the reasons behind OSL's low profile is that it has not yet raised equity from the public. Kumar says the promoters were about to file for an IPO in 2008 but the crash in the markets led to those plans getting shelved. But it is an option in the future. The other possibility is a strategic sale to a foreign port operator which would allow the PEs to exit. Four PEs, together, hold 45 percent in the company today: India Equity Partners, Kaup Capital of Singapore, IFC and Standard Chartered. "We've had a banking relationship with Ocean Sparkle for many years, and were looking for an opportunity to invest," says Rahul Raisurana, managing director, StanChart PE. Risk factors: OSL notched up a PAT of Rs 58 crore in 2012-13 on consolidated revenues of Rs 376 crore. Profits have grown steadily. Yet the slowing down of the Indian economy would be an area of concern. Also, some port operators like the Adanis prefer to conduct the operations themselves. 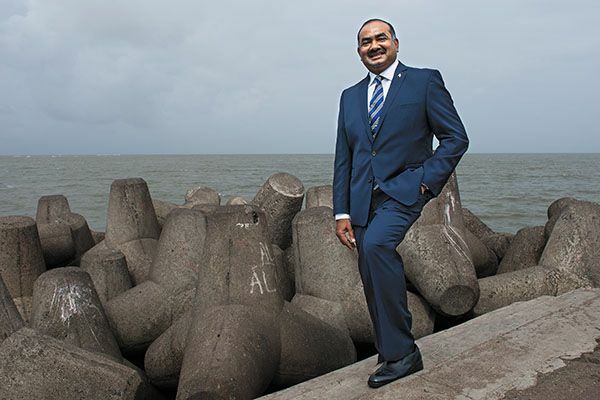 Adani's Mundra Port has recently overtaken Kandla to become India's largest private port.